As its name aptly suggest, iDevUA’s Glass Tower 2 is a game app where a tower made of glass bricks presents itself as a puzzle – how do you get rid of the blue blocks without making the red blocks fall off? Simply tapping the blue blocks will obliterate them (with a satisfying shattering sound) and gain you points, but do this carelessly, and the red blocks will tumble off the platform and break, knocking points off your score as well as health points off your total lives. The main enemy in Glass Tower 2 is physics – the blocks will fall accordingly, depending on which ones you destroy (similar to Tiki Totem), and the different shapes and sizes of the blocks also come into play to affect how they’ll fall. The normal square-shaped blocks are worth 10 points (you gain 10 points if you destroy a square blue block, while you’d lose 10 points if you accidentally shattered a red square block), the triangles and small rectangles are worth 20 points, and so on. Every red block you lose also costs you a life, thankfully no matter its size or shape. The red and blue blocks are joined in later levels by green and black blocks, which you won’t be able to destroy at a single touch – the green blocks can shatter when you make them fall off the platform, but the black ones will stay wherever they first appear, even in midair. Adding to the gameplay are bonuses that float up from either side of the platform – you can tap these to gain extra lives, switch the colors of the blocks, and even control gravity by tilting your iPhone, among other goodies. The free version of the game comes with 10 levels, but for $0.99 each, you can purchase two level packs, which come with an additional 75 levels per pack. 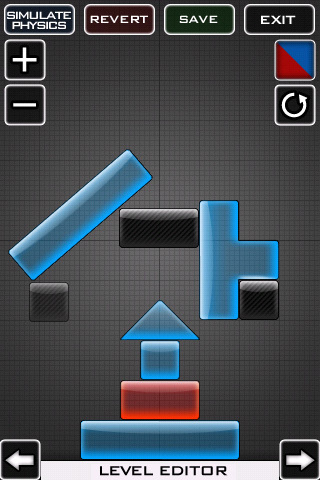 There’s also the optional level editor, also $0.99, where you can create your own puzzles. Glass Tower 2 is not too challenging – you can complete the free levels quite easily – but its catchy sounds (the voiceovers are particularly excellent), futuristic soundtrack, and clear, crisp graphics make it worthy of repeat plays to achieve the “perfect game,” where you clear a level without losing any red blocks. Glass Tower 2 is a great way to stretch your mind without losing any sweat, but for a more extensive puzzle game, you may have to fork over the extra cash. Note: An iPad version is also available. Glass Tower 2 HD sells for $1.99 in the App Store. AppSafari review of Glass Tower 2 was written by Julie Guan on July 7th, 2010 and categorized under App Store, Free, Fun, Games, Physics Based, Puzzler. Page viewed 7253 times, 2 so far today. Need help on using these apps? Please read the Help Page. When ever I try and open Glass Tower 2 I get a message saying System Message Memory warning. Only happens on this app. Yea – I get that also on my 3gs. Doesn’t seem to affect game play, but it is annoying….